Dreamy jersey knit blazer is pieced with many fabrics— woven, lacey, brocade, velvet, and chiffon—in ivory and gray. 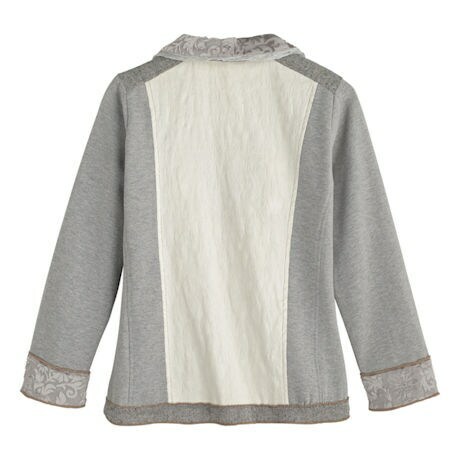 Trimmed with lace, braid, and satin, serged edges and shell and metal buttons. 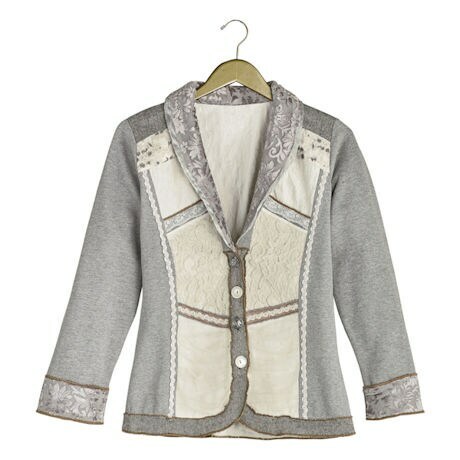 Shawl-collared blazer is rayon-cotton blend.Sizes S(4-6), M(8-10), L(12-14), XL(16-18), 1X(18-20), 2X(20-22), 3X(22-24). Hand wash or dry-clean. Imported.